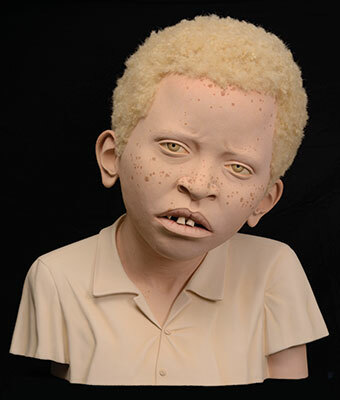 Tip Toland, African Child with Albinism, 2013, paint, pastel, and synthetic hair on clay. Painfully accurate and intricately detailed, Washington artist Tip Toland’s larger-than-life figurative sculptures are intimately observed. Her work startlingly delineates imperfections such as wrinkles, sun spots, and other physical blemishes while conveying a pervasively caring sense of humanity. Toland has always been concerned with the figure: Her early work was primarily surrealistic, inspired by late Gothic artist Fra Angelico, Persian miniatures, and Surrealists René Magritte, Giorgio de Chirico, and Remedios Varo. Her current work, of exquisitely super-realist monumental ceramic portraits and a twice-life-size full figure representing Mother Africa, has a powerful political subtext—it addresses the plight of African albino children who face horrific persecution. The work is deeply psychological, and quite disturbing. The artist has said about her work that it “softens our hearts to what we are afraid of.” With a probing examination of superstition, prejudice, and vulnerability, her work is cruel, kind, and always provocative. APEX is an ongoing series of exhibitions of Northwest-based artists, curated by Bonnie Laing-Malcolmson, The Arlene and Harold Schnitzer Curator of Northwest Art. The series is supported in part by The Arlene and Harold Schnitzer Endowments for Northwest Art and the Paul G. Allen Family Foundation.